What do you think of my new assistant? 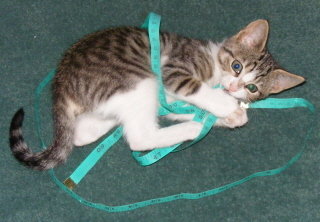 She is practising her measuring techniques at the moment. Mind you as an assistant she makes for a great distraction, probably not what I need at the moment when I’m trying to finish off my new Block of the Month. It will be off to the quilters this weekend (fingers crossed!). So as promised here are some snippets (just a peek now! 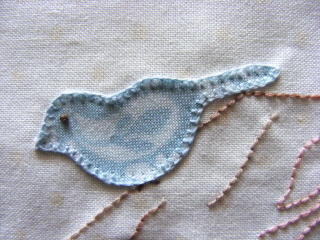 ), and when it arrives back from the quilters I promise to show you some more. Meanwhile it is back to some more sewing and possibly some training for the new trainee. She is ever so sweet, I don’t think she will be leaving us (we are only kitten sitting at the moment – with the possibility of keeping her at the end). She was a rescue kitten and has now just turned 8 weeks old. Not only does she have potential in the sewing room but she makes a great footwarmer! Guess where she is at the moment – asleep on my foot. Someone was very excited when she came home from school yesterday and found a copy of Creating Country Threads magazine Vol 10 No 7, open on the coffee table with the stitcheries I made from her drawings on display. It has been a while now since she drew these quaint little pictures (she is now 10!) but they are still favourites of mine. I hope they inspire you to turn some of your loved one’s drawings into a keepsake for gifts or to pass down as an heirloom in years to come. Thanks to the Random No. Generator you have been chosen to receive a copy of my pattern “Dusk”, so please send me your snail mail address via my email at info@petalsandpatches.com so I can post it to you. Have had a few technical problems this week so sorry for the delay. I have one “HOT” little computer (the fan stops & starts) so I have to keep turning it off for a rest. Really do need to give it some TLC very soon. 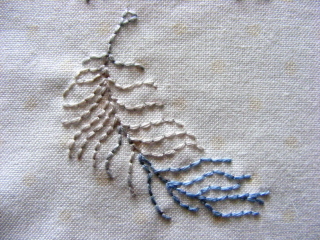 While I have been on holidays, I have also been busy with some new patterns. This is a picture of a new quilt entitled “Dusk”. 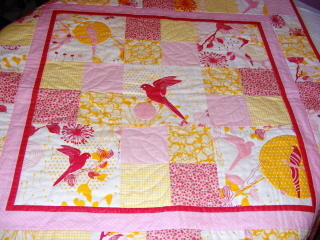 It is a small beginners quilt 36″ square and features the beautiful fabric from Saffron Craig from her “Fields Range” called “Parrots” along with a few other fabrics that co-ordinate with it. You may have seen in an earlier post the dress that I made my daughter using this fabric. Well I finally finished the bag to co-ordinate with the dress. It is called “Dawn” and will also be available as a pattern as soon as I can write the instructions. Both patterns will be available shortly. 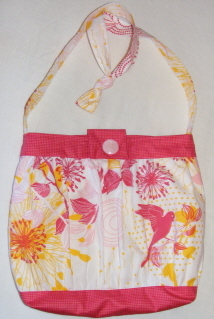 The parrot fabric is so bright & colourful and reminds me of the sun as it rises & sets. Now some more news, Laura from institches.com.au is currently featuring interviews from designers and she is currently featuring Petals & Patches. So pop on over to her blog at laurainstitches.typepad.com for a visit. She is also featuring a pattern giveaway if you leave a comment. If you leave a comment on my blog before the 14th February I will also randomly pick a winner to receive a copy of my new quilt pattern “Dusk”. 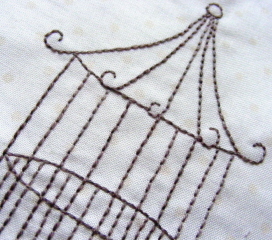 Laura also stocks the “Parrots” fabric. Holidays are a wonderful thing! I’m finally back! Sorry I haven’t posted for awhile. We had a lovely relaxing holiday in Bright, so relaxing that it has been hard trying to get back into the swing of everyday life. Bright is a very pretty town nestled in the valley near Mount Buffalo. What’s even more exciting than the surrounding scenery though is the fact that they have not one, but two patchwork shops as well as some lovely gift shops. Both shops are lovely and so easy to spend time & money in. If you get the opportunity to visit, it will be well worth your while. 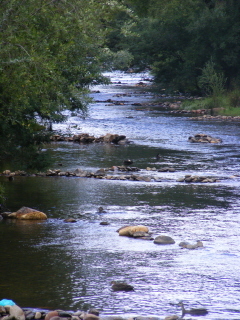 This is a photo of some of our neighbours while on our trip. 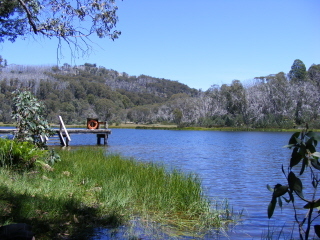 It is so lovely to wake up with the sounds of kookaburra’s laughing and ducks popping in for breakfast. Now, however, I’m back into full swing with our house renovation finally starting to show some progress, but with this brings the endless waiting for tradesmen to turn up & deliveries, etc. Just have to spend my waiting time stitching. I suppose there are worse things I could be doing. I will give you a preview of some of my new Block of the Month in a coming post, so stay tuned.